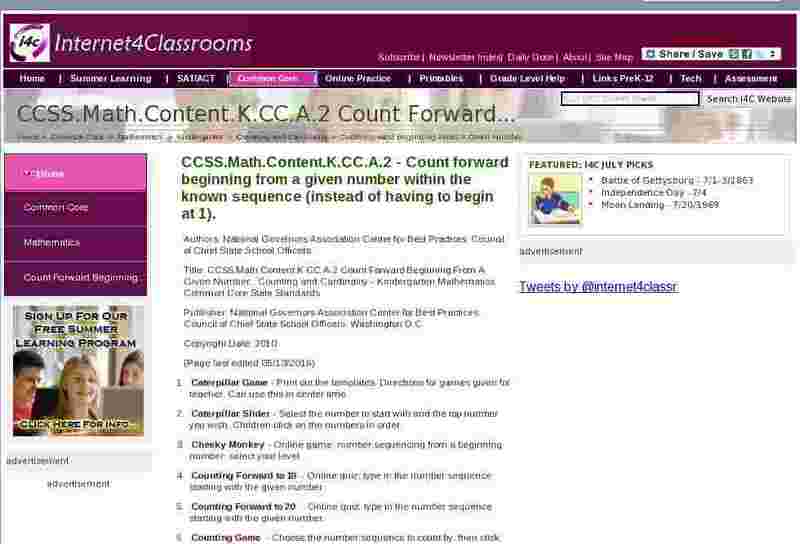 CCSS.Math.Content.K.CC.A.2 - Count forward beginning from a given number within the known sequence (instead of having to begin at 1). Caterpillar Game - Print out the templates. Directions for games given for teacher. Can use this in center time. Caterpillar Slider - Select the number to start with and the top number you wish. Children click on the numbers in order. Cheeky Monkey - Online game; number sequencing from a beginning number; select your level. Counting Forward to 10 - Online quiz; type in the number sequence starting with the given number. Counting Forward to 20 - Online quiz; type in the number sequence starting with the given number. Counting Game - Choose the number sequence to count by, then click play. Find the missing number in the sequence. Counting Sticks - Online game; count on from any given number. Number Sequence - Online game; jump to the next odd number. Number Track - Scroll down and click on the Number Track Game. Place the number tiles into the correct order on the track. There are 3 levels of difficulty. Saucer Sorter - IWB game; select a start number; cover one of the numbers with the star and let class guess what number was covered. Whack a Mole - Decide on a starting number then whack the next number.